Employers are increasingly recruiting their workers into politics to change elections and public policy - sometimes in coercive ways. 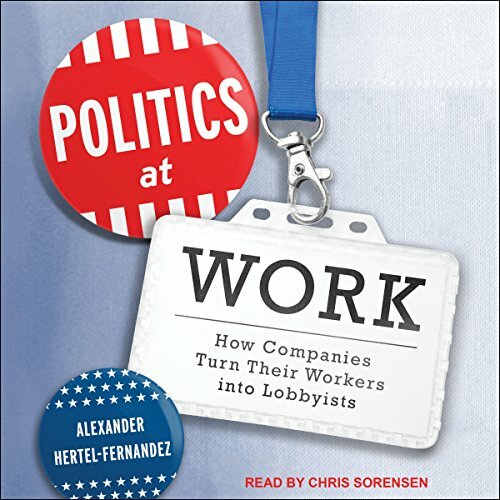 Using a diverse array of evidence, including national surveys of workers and employers, as well as in-depth interviews with top corporate managers, Alexander Hertel-Fernandez's Politics at Work explains why mobilization of workers has become an appealing corporate political strategy in recent decades. The book also assesses the effect of employer mobilization on the political process more broadly, including its consequences for electoral contests, policy debates, and political representation. Hertel-Fernandez shows that while employer political recruitment has some benefits for American democracy, it also has troubling implications for our democratic system. Workers face considerable pressure to respond to their managers' political requests because of the economic power employers possess over workers. In spite of these worrisome patterns, Hertel-Fernandez found that corporate managers view the mobilization of their own workers as an important strategy for influencing politics. As he shows, companies consider mobilization of their workers to be even more effective at changing public policy than making campaign contributions or buying electoral ads.